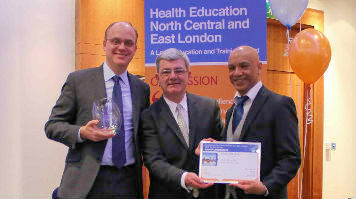 Two LSBU academics have been recognised for their exceptional work as trainers in the Health Education North Central and East London 2013 Quality Awards. We are delighted that Professor Marcantonio Spada has won 'Trainer of the Year', with Mr Carl Chandra, Senior Lecturer in Learning Disability Nursing, being highly commended in the same category at the Health Education North Central and East London 2013 Quality Awards. The awards ceremony was held on the 3rd of December 2013 where the 35 short-listed nominees, who were whittled down from over 140 nominations, were celebrated for their outstanding work in North Central and East London. As part of the nomination process, Marcantonio's students were asked to submit a statement about their tutor : "His warm hearted approach enables him to quickly build relationships with students. Despite his vast knowledge, experience and achievements, he has the ability to put students at ease where they can take risks in their learning without fear of ridicule or any other adverse experience. "His sessions are always humorous but highly productive. As a student you are always left with a sense of being glad that you were in attendance and eager for more", the students added. I am delighted and proud to have won this award. It is in recognition of the work jointly undertaken by LSBU and North East London NHS Foundation Trust in fostering Cognitive Behaviour Therapy across both organisations. Professor Marcantonio Spada, formerly Professor of Psychological Therapies in the Department of Mental Health and Learning Disabilities at LSBU, and Consultant and Trust Lead in Cognitive Behaviour Therapy at North East London NHS Foundation Trust, has recently moved into a new role within LSBU as Professor of Psychology in the Department of Psychology, Faculty of Art and Human Sciences. Find out more about our Cognitive Behaviour Therapy, Learning Disability Nursing and Psychology courses using our online course finder.